Cancer researchers believe they have another bright spot in mesothelioma treatment: positive results through a combination procedure of lung-sparing surgery and photodynamic therapy. Doctors from the University of Pennsylvania conducted treatment studies that extended survival rates and progression-free survival rates among participating mesothelioma patients. Mesothelioma is commonly diagnosed in its later stages, often leaving patients with limited options. 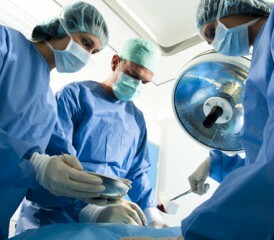 Surgery, chemotherapy and radiation therapy are the most common treatment procedures. Researchers have experimented with different forms of these treatments to determine the most effective form. The study, published in The Annals of Thoracic Surgery, analyzed 38 patients who received both the lung-sparing surgery, known as radical pleurectomy (RP), and intraoperative photodynamic therapy (PDT). Thirty-five patients in the group also received systemic chemotherapy. All the participating patients were previously diagnosed with stage III or IV mesothelioma cancer, as defined by the American Joint Committee on Cancer. The survival rate for patients who underwent this treatment extended beyond common averages. The median survival rate was 31.7 months for all participating patients. Researchers aren’t certain for the reason for the prolonged survival. Patients with epithelial mesothelioma benefited the most from the treatment, showing a median survival of 41.2 months. For all the patients, the median progression-free survival was 9.6 percent. For the epithelioid group, the rate was 15.1 percent. Experts have long considered RP unfeasible in treating mesothelioma because it was unlikely that all the cancer would be removed during the procedure. However, by combining RP and PDT treatments in this study, positive results can be found. In most circumstances where surgery is required, an extensive procedure known as extrapleural pneumonectomy (EPP) is more commonly used. The ages of the 38 patients ranged from 42 years old to 81.